Towards the end of 2017, I undertook the spiritual writer Mitch Horowitz’s 30 Day Mental Challenge, a short but impactful self-development program, aimed at putting the philosophy of positive mind metaphysics to the test. I have now gathered up my diary entries and notes and organized them into a blog post detailing my experience. I started the challenge on December 1st 2017. I was coming to the end of a 3-month work/charity trip that I had taken with my husband. We were having a great time, but I was a little bored and growing increasingly frustrated with being away from home. I aimed to use the plan to cope with the remainder of the trip. My approach to the challenge was to create a contract with myself in which I would commit to policing my thoughts, attitudes, and responses to everything around me. I also promised myself that my thoughts, attitudes, and responses would always be positive ones. And so, if I felt anxious, irritable, or sad, I would replace those energies with feelings of positivity, and calm. I also decided that I would find an effective trigger for instantly accessing a happy mood whenever I felt down. The 30-Day Mental Challenge itself seemed fairly flexible, that’s to say, it prescribed only that the experimenter committed 30 days to thinking positively without outlining a distinct method for doing so. I decided, therefore, to commit 2 – 3 minutes, 8 times a day (at 12 midnight, 3 am, 6 am, 9 am and so on) to checking in on my mood and making any adjustments needed. Naturally I couldn’t do anything when I was asleep, but if I happened to be awake during these times the process would continue. I’d like to mention here that if you are new to positive mind metaphysics a very simple way to monitor mood is to do the following: (note: you do not have to be physically alone to do this) Breathe deeply in through your nose and hold your breath for as long as is comfortable, allow the muscles at the side of your mouth to move as though you might smile, but do not smile. If your mood is high you should notice a pleasurable tickle at the back of your throat, if your mood is low, however, you will notice a discernible dullness at the center point just above your diaphragm. As soon as the sensation is felt, release the breath. Repeat as often as you need to, to be certain. To adjust your mood from low to high, you can, while breathing in through your nose and out through your mouth, mentally repeat the phrase “I Am that I Am.” As you feel yourself relax, imagine that the second ‘I Am’ represents an emotion such as happiness or love. Do this for no more than 2 – 3 minutes. If the effects of this exercise (most commonly a light and joyful calmness) are not instantaneously felt, they will be in a short time and possibly accruing without you realizing. The first 3 days of my experiment were wonderful. I was quiet, reflective and pleasantly surprised by how effective it was. What I did not know was that I would shortly need to apply the philosophy to a circumstance so deadly and unexpected, it would put the 30-Day Mental Challenge to the ultimate test. I fell ill and was hospitalized with Malaria and Typhoid. The strains of Typhii combined with my already anemic blood were of grave concern and for a while it looked as if I would die. In the days that followed while I lay motionless in hospital I stuck to the challenge. I did as much as I could to persist in the task I had set myself and it really helped. In fact, although facing the grim prospect that I might die, and having told my husband that I needed him to help me get my affairs in order, I was strangely calm. I distinctly remember that the only thing making me truly sad was witnessing the pain being caused to my husband and the thought of the pain my death would cause to my parents and other family. I do not know exactly where my strength came from, but I am convinced that the 30-Day Mental Challenge played a crucial role. I did not die and just under two weeks after being admitted to hospital my strength gradually returned. I was able to sit up in bed and eat, and eventually start to move independently. That I could walk and talk again was nothing short of a miracle. Too little attention is given to the internal environment in my view. I am not talking about those who meditate, pray, eat healthily, do good to others, and so on, I mean that more attention should be given to the mind as the basis for all that is, by all of us. By mind, I am referring to our capacity to recognize and operate our human imagination – a subject I write about but will not address here. Death for some is terrifying and I am not encouraging anyone to become preoccupied with it. I myself want to live and I do feel the sadness of death. In fact, I fervently believe that its inevitability frees us to let it take care of itself while we, in the meantime, focus on extracting every last drop of joy and pleasure from this great gift of life. My beliefs may seem radical to some, and to be honest I am not askin anyone to share them. Rather, I am asking anyone who is willing, to investigate my beliefs by embarking on a personal journey of discovery. Discovery that is made possible through exercises like Mitch’s 30-Day Mental Challenge, and those I write about. 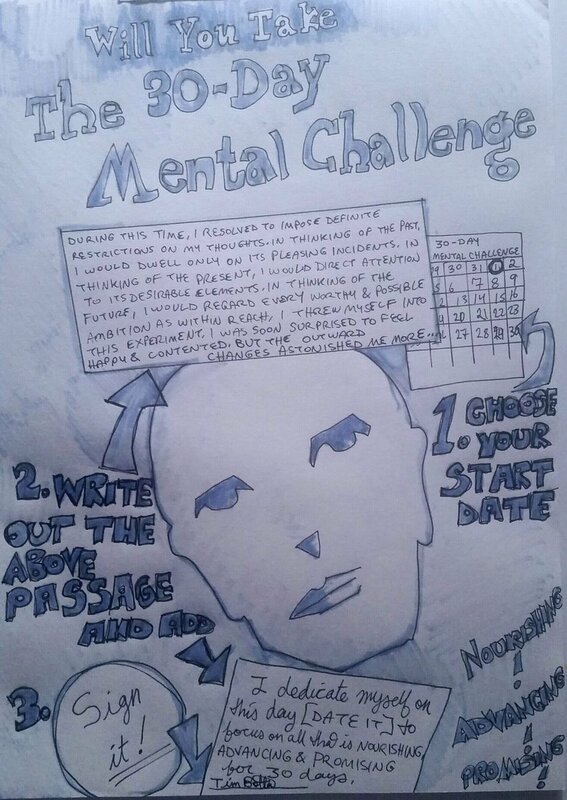 There are no barriers to entry when it comes to the creative use of imagination, and the 30-Day Mental Challenge is one such example. Don’t be dissuaded by naysayers. Unless they are offering you a solution to your problem gift wrapped, you are no worse off for ignoring them. You will, however, be better off as you start to exercise authority over your condition. It may not be easy, but I am living proof that it can be done. I have no background or network that I have relied on. I am where and who I am because I dared to believe. Everything I have attained was done through Imagination, Imagination that manifested as physical natural events. Had I not changed my mind I would not be here and I am telling you, you can do it to. Something as simple as a 30 Day Mental Challenge could be the perfect place to start. Katherine Jegede is the author of Infinite Possibilitiy: How To Use the Ideas of Neville Goddard to Create the Life You Want to be released in June 2018. She is also a humanitarian and has hosted television shows for Channel 4 Television, UK, and radio shows for the BBC.